We offer a choice of chimney systems to suit all styles of property including barn conversions which often require a metal chimney above the roof to meet with planning regulations. Building a new chimney as part of a new build process or extension is easy and economical but we can also advise on appropriate ways to add a chimney to an existing building or specific room. We reline existing chimneys. Having a lined and well insulated flue will ensure your stove runs both safely and efficiently. We recommend lining your flue with new liner as part of your installation and see this as good working practice. Most houses built prior to 1965 (before a change in the Building Regulations) were built without liners. Flues were usually lined on the inside with lime mortar, which over time can erode and crack, as can the mortar between the bricks. One obvious sign of this is usually sand like material falling down the chimney (the old lime mortar). Erosion of the lining leads to leakage of flue gases, resulting in reduced chimney draw, as well as the potential dangers associated with smoke and fumes leaking into the living spaces. Houses built after 1966 should have lined flues, usually of clay, though it should be noted that this type of lining is not necessarily suitable for an efficient wood or multi-fuel stove, and re-lining may still be advisable. A lined and well insulated flue will produce an efficient and safe appliance. Unlined flues can result in costly remedial building work. The old flue surface is eroded, causing fume leakage an poor up draught. The flue is too cold and not drawing properly. There are a number of chimney lining options available, depending on the particular chimney type and the appliance in use. Our chimney engineers will first carry out an on-site chimney inspection. This includes sweeping (if necessary), smoke testing, checking the condition of your chimney pot (from the roof) and checking the condition of your current chimney lining. If required it may include a CCTV survey. We inspect the chimney stack and take measurements of the fireplace opening with relation to the appliance and the relevent building regulations. We will advise as to whether remedial work is required, and if it is, discuss with you the options available. Stainless steel flexible liner. This is a quick to fit solution suitable for installation into existing properties for use with inset fires, as well as wood or multifuel stoves. Specialised metal systems are also available for use with gas or oil fired appliances. Eldfast aggregate and resin lining. This modern, ceramic lining and repair agent is suitable for use on concrete block, brick and clay flues and its nominal coating thickness ensures that vital minimum flue measurements are retained. Twin wall insulated chimney systems. 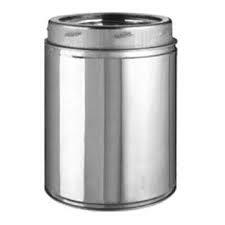 Prefabricated stainless steel flue systems for use where a new or replacement flue is required. Chimney fans. Can be used to improve the performance of an existing flue system to enable use with a wider range of appliances. Browns is HETAS Approved Retailer, and all our engineers are HETAS Approved Installers. This means that you can be assured of the quality and safety of our work, and that we are authorised to self-certify that installations we carry out are in accordance to the relevant building regulations.